“Growler.” Say it three times in a row, adding in extra “grrr” flair each time, and you’ll probably enjoy saying the word as much as I do. Besides being just a great word, did you know most brewpubs and breweries across the U.S. sell growlers today? It’s a true and wonderful fact. So what is a growler exactly, and where did this lovely word come from? A modern-day growler is simply a glass jug that carries anywhere from a half-gallon to a gallon of beer that allows one to carry fresh ale from a local brewpub to home. Filled straight from the tap and sealed with a twist-cap or a clampdown top, filled growlers typically range anywhere from $7 to $17, depending on the size. The beauty of the growler is that is it reusable. After you’ve enjoyed your growler at home (they only have a 2-3 day shelf-life once opened), you can continue to bring back in your washed growler and get a refill for a lower price (refills range from $5-$14). OK, back to the origin of the word “growler.” Back in the late 1800s, beer was carried home from the local pub to home via a small bucket with a lid (great image, eh?). Word on street is that when the beer sloshed around in the bucket, it created a rumbling (enter “grrr!”) sound as the carbon dioxide escaped from the bucket lid. “Growler” soon became the name for this traveling bucket ‘o beer. My husband owns two growlers from the Russian River Brewing Company in Santa Rosa, CA. We always stop at the RRBC to fill up on the latest brews and enjoy with friends and family at home. Next time you are at your favorite brewpub or brewery, ask if they sell growlers – chances are they do. Then invest in your very own glass jug filled with your favorite ale. Chances are you’ll be coming back frequently to reuse and refill your glorious grrr-owler. My husband and I celebrated our one-year anniversary on June 7th (woohoo, one year down!). So about a year ago, I was in the throes of wedding planning. I wasn’t a big fan of planning a wedding. Don’t get me wrong…I couldn’t wait for the big day. But I just didn’t like all the details and agonizing, life-altering decisions. Hydrangeas or roses? Place cards or no place cards? Wedding cake or cupcakes (more to come on this in a later post)? But one thing I absolutely loved was setting up my wedding registry. You get that registry gun in your hand and you just start scanning everything in the store, regardless of whether you’ll use it or not. As we were making our way through the kitchen department, I was scanning everything in sight. I wielded that scanning gun with the expertise and accuracy of Wyatt Earp at the OK Corral. I was scanning things behind my back, over my shoulder, with both eyes closed…until I came upon a Belgian waffle maker. My husband thought this was the one thing that would absolutely make or break our ability to have a well-prepared kitchen. I was adamant that we would never, ever use it and it would just collect dust. I stuck to my guns (literally, I wouldn’t let him have the scanner) and “we” decided not to register for it. I reluctantly broke the seal of the box and set up our waffle-making station. On the menu: Toasted Almond Waffles with Strawberry Sauce. I love waffles and make them quite frequently…in the toaster. These waffles were different. So light and fluffy and cooked to a perfect golden brown. They turned out so delicious that I’m not even going to say how many we ate between the two of us. And we ate them so fast I didn’t even have time to take any photos to share here! So I stand corrected. I’m proclaiming to the world that I was wrong about the waffle maker. It isn’t a registry reject and now, instead of collecting dust in my basement, it has prime real estate in the cabinet above my kitchen stove. Isn’t admitting when you’re wrong one of the most important lessons you can learn during the first year of marriage? San Francisco and coffee just seem to go together. We are fortunate to have several top-notch coffee roasters based here in the Bay Area, but one of my favorite coffee company, Blue Bottle Coffee, happens to have two outdoor kiosks plus one storefront inside the Ferry Building. Three locations in one spot – and the wait is still at least 20 minutes long! The wait is well worth it though. Brewing each cup of coffee individually in ceramic filter is a unique process we’ve adopted at home as well. We always make sure to pick-up one or two bags of Bella Donovan, which I highly recommend. With a Café Au Lait in hand, I’m ready to explore the rest of the market. While every stand is worth visiting, I do have my select favorites that I always make a point to stop by to taste, chat and buy some fresh goodies. From Dirty Girl Produce to Frog Hollow Farms and Della Fattoria breads to Acme breads, it’s truly impossible to leave the market empty-handed. Not matter what the season, I am always overwhelmed by the vivid colors and smells of the market. From fresh breads to roasted chickens to ruby red strawberries, a stroll around the market is always a feast for both the eyes, and stomach. Keeping up with food trends is a full time job, and I’m sure glad it is my job. But, just when you think your mind is filled with every possible foodie tid bit, you read something so compelling and unusual, you remember you’ve got a lot to learn. This realization is even more grounding when you’re inthralled by reading trends in United’s Hemispheres magazine. We know Tokyo is cutting-edge in everything from food to fashion to gadgets. The latest rage takes nutraceuticals to a whole new level. Today, there are hundreds of beauty-food restaurants, the majority in Tokyo, featuring sophisticated menus claiming to turn back the clock. And their primary ingredient is collagen! Typically, collagen is injected into the face or lips for a nice line filler. But Japan is all for ingesting this tasteless protein derived from animals’ connective tissue. Dishes like the one above, Nabe, are hot pot soups topped with collagen. Cocktails pumped with vitamins and supplements are paired are served as well. Has anyone tried this? And would you? I’m sticking to good ol’ fashioned suncreen though a vitamin cocktail seems like a terrific idea. The Share Our Strength Food Arts BBQ is a foodservice industry “who’s who” and hot spot for epic culinary creations. Angus Beef knocked it outta the park this year with two exceptional dishes. 1) Chiptole-braised Angus beef brisket gremolta (pictured above) served in a bone with a delicate wooden fork. How SUSTAINABLE! Crowds were awestruck, though the occasional, “I’m not a dog,” lash did come up. 2) Carpaccio of Angus beef tenderloin with roasted garlic flan and ginger consommé was a decidedly Asian soup idea. The savory broth poured over the tenderloin instantly revived the beef flavor, texture and appearance. David Burke, known for steakhouse favorites set up a mini “Crab Shack” serving spicy crab soup, soft shell crab mini sandwiches and a homemade ginger-lemon beer. The bounty was donated by Litchfield Farms Organic & Natural Seafood. It’s true, as consumers continue to battle with lost jobs, increased prices and demanding schedules, many are looking for meals that they can enjoy at home. 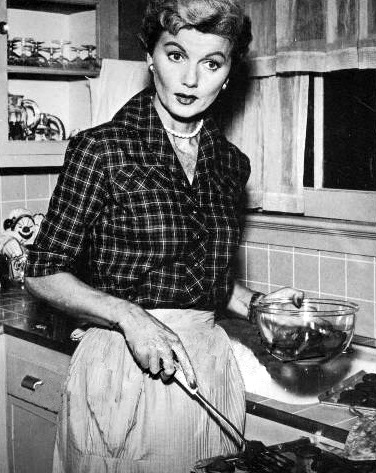 Flashing back to June Cleaver, who spent all day in the kitchen preparing the family dinner? Not quite. Convenience is a major factor for today’s consumer, too…and while many seem to be eating at home more, they’re not willing to sacrifice that extra time slaving away over a hot stove. Easy recipes, convenient ingredients and delicious results. Sounds like a mantra to live by, right? At a time when it seems like everyone is cutting back on something, companies and consumers alike are thinking outside the box, but inside the home. Kraft Foods is combining comfort food and nostalgia to get consumers to celebrate “National Grilled Cheese Month” with a contest inviting them to write about what the grilled cheese sandwich means to them. The cornerstone of this campaign is Kraft Singles, which, according to Advertising Age, Kraft will position as a way to eat for less than $1. Some consumers are taking a hands-on approach to eating in. Cooking classes geared toward the “everyday cook” are becoming a popular way for consumers to learn how to navigate their way around the kitchen. An added bonus: these classes provide a cheaper alternative to dining out because you often get to sample the final product at the end of class. Yum! Even your favorite upscale magazines are catering to the frugal foodie. If you flip through the pages of Gourmet or Food & Wine, gone are the complicated menus and two-page recipes. Instead, you’ll find stories like how to choose an affordable wine without sacrificing taste. Gourmet features an “Extreme Frugality” column on its site and even included a ham sandwich on its March cover. A ham sammy? Now that’s my kind of recipe…dinner at my place, anyone?